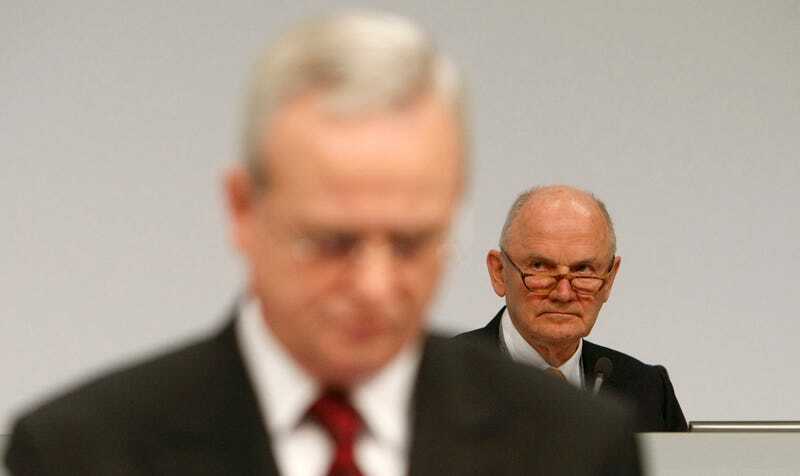 Ferdinand Piech, supposedly all-powerful scion of the Porsche-Volkswagen extended family and Volkswagen board chairman, quit abruptly earlier today as it has become clear his attempt to oust current VW CEO Martin Winterkorn has failed and much of the rest of the board has turned him. This is a big deal. Piech made the move Saturday, according to Reuters, leaving essentially all of his many positions as the most powerful person in the company (other than massive shareholder, I suppose). As the oldest leader at any publicly listed German company ever, the 78-year-old Piech has had his way with Volkswagen for a generation and was supposed to stay on through December 2016. Being head of the family behind the company meant that Piech has been able to exert extreme control of the company, ousting the last two CEOs through the power of his will and the hint of his displeasure. But when Piech made mention in a report in Der Spiegel that he didn’t have confidence in CEO Martin Winterkorn in the middle of the company’s restructuring efforts, it turns out that he had that somewhat backwards as the rest of the VW board had more faith in Winterkorn than in the aging Piech and the board let everyone know it. Piech, while older, is still clear-eyed enough to see the scribbling on the walls in Wolfsburg and decided to quit before a vote of no confidence. This leaves Winterkorn now as the most powerful man at what could be soon the most powerful car company in the world. Where it leaves Porsche CEO Matthias Mueller – whom many suspected to be Piech’s choice to replace Winterkorn – is somewhat uncertain. At the very least it’s going to make the company picnic a little awkward.